Um... I don't know what came over me..... I saw this picture, and, well... THIS happened... XD. Wallpaper and background images in the Os Pinguins de Madagascar club tagged: penguins of madagascar skipper kowalski private i don't know what i've done!. 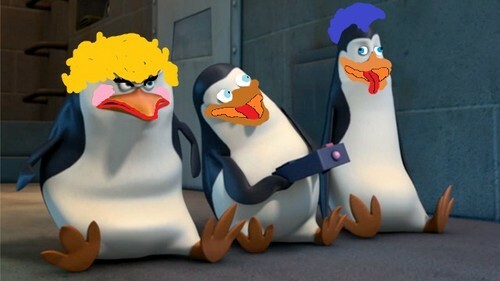 palavra chave: Os Pinguins de Madagascar, skipper, kowalski, private, i don't know what i've done! Poop... doesn't it belong on YouTube? Oh ya about the pic, pretty... umm... Creative? ^I agree with that face. Wow.... We all look soooo.....................................­...­...­...­...­...­...­...­...­...­...­...­...­...­...­...­...­...­...­...­...­...­.. I don't even know! ^ Yeah, but just can't remember where. Probably from a cartoon or film. Or the 'Goonies' except she has brown hair. ^I can't remember either. It could be. @Sgt and PB: Just to let ya know, I haven't heard of those guys, so I couldn't have copied from them. ^^^I wasn't sayin you were copying from them. I was just sayin he looked familiar. 0_o i will never sleep again! ^ Maybe you could take a screenshot, and post it here. ^Hm,how can i do that? It's in the Xbox,how can i do? ^ Oh, well, maybe if you have a camera, take a picture, then upload it to your computer, and then to Fanpop. ^ I mean a digital camera. ^ Probably not. If you have the curtains close, or the light off. Maybe no flash, either..
^ It's cool that you're going to try it. ^Oh!Thanks! And it's also cool that my father haves a xbox!!! And he gived me a wii!!! Love him!!! XD!!! XD! Doctor Who famous quote.